Idea: Daily Use Is a Proof of Quality – So What Do They Wear? What is the best fitness tracker is a question we all want the answer to, right? It could definitely help to know when you are searching a new product to buy. I thought: Why not ask professional runners, personal trainers, and activity tracker reviewers? The one product they end up using on a daily basis after testing dozens of different tracker gadgets could give us a great indicator on what is the best. That’s the idea behind this article and I’m really excited about giving you the results. I’m dying to hear what a professional athlete wear on a daily basis! I have asked 8 influential and great people who run their own blogs, or YouTube channels about fitness technology, two questions. These guys really know what they’re talking about! The persons behind Techy Agent, RizKnows, GetFitOver40, Fitness Equipment Cafe, HASfit, TheFitBlog, Fitness Fashionista, and the5krunner happily gave me their engaging answers. Some answers are quite thought-provoking as well. Be sure to read all the way to the bottom were the5krunner sums it up. You’ll get some interesting thoughts from a runner professional. • Which fitness tracker are you wearing right now? • What is your all-time favorite activity tracker? When you have read the whole article you will see that are at least one activity tracker that seems to be a favorite among the experts, and a couple they disagree on. I leave it up to you to figure out which one! Here are the answers they gave me. Eric runs the extremely informative YouTube channel Techy Agent where he posts video reviews and reports on all the latest of wearable technology. He talks a lot about activity trackers and fitness bands, and if you have ever searched on YouTube on products in that category I bet you have already seen his work. He pops up right on the top of every search result! He’s also on Facebook and Twitter. Be sure to follow him there too! I’m usually wearing two fitness trackers at a time. The Apple Watch has become my daily wearable, tracking steps and distance and helping me figure out my calorie needs by syndicating the activity data over to MyFitnessPal which are a food tracking and dieting app. On my other wrist, I’m usually wearing whatever fitness tracker I am reviewing at the time. For example, this last week I’ve tried the Avantek fitness tracker, which is a decent fitness tracker, but not one I would choose to wear as my daily wearable. He is wearing several trackers, of course, as the true quality tester he is. I didn’t see that coming, but I suppose it’s an excellent way to measure accuracy between different activity trackers. I’m quite interested in the Avantek tracker myself so I’m looking forward to his video review. 1 – the Polar Loop (with Bluetooth chest strap combo) it is really good at tracking calories and does a great job actively tracking the heart rate during exercise. 2 – the Garmin Vivoactive (with chest strap). This is a very versatile and capable fitness tracker, with built-in GPS and good heart rate tracking with the chest strap. I also like that it has some built-in smart watch features. 3 – the Apple Watch. This has been my favorite smart watch, and I like the fact that it can do a pretty good job tracking fitness, and it can pair with a Bluetooth Heart rate monitor. These are great choices, Eric. I wore the Polar Loop for almost a year myself. Now it has come in version 2 with several upgrades and I’ll write about that one later. Also, note that he likes the Garmin VivoActive. Maybe that one turns to be a favorite among the others as well? Jeff runs the quality website rizknows.com and the YouTube channel RizKnows. He tests and reviews everything that has to do with fitness gadgets, training shoes, and training equipment. I love his videos and his personality. Go check out his site, channel and follow him on Twitter. Right now I’m wearing Garmin fenix 3. While it’s not solely a fitness tracker (also a GPS watch and smartwatch), It’s outright the best fitness tech device on Earth right now. I run, bike, hike, swim, CrossFit, lifts weights, paddle board, do plyometrics, yoga, and the list goes on. The fenix 3 is the best device for keeping up with all that I do. I never want to take the fenix 3 off. Can you tell that I like it?? I sure can! The Garmin fenix 3 is a superb sports watch with great design and with features made for the best athletes, so I have no problems understanding it fits you perfectly. It’s an impressive array of sports and activities you master, Jeff. The second question was about all-time favorite activity tracker. For most people, I recommend one of three devices: Fitbit Charge HR, Garmin vivofit 2, or Garmin vivosmart. I have more demand for the Fitbit Charge HR, however, I think I have had more positive feedback regarding the vivofit 2. As such, I have to go with the vivofit 2 here, but the Charge HR is a very close second. The Fitbit Charge HR with inbuilt optical heart rate monitor was one of the most anticipated activity trackers in 2015 and so far very few products can cope with it. I wrote about it earlier this year. Michael’s site GetFitOver40.com is a great resource site for people in their 40ties and above that want to get in shape. Mike is a passionate fitness guy, which is easy to understand if you see pictures of him. He has tons of useful information and reviews you should watch and read on the site and his YouTube channel. Facebook, and Twitter. The Garmin VivoActive is a fully functioning Activity Tracker with daily step and distance counting, calorie tracking and auto sleep detection. The Garmin VivoActive has a built-in GPS for when I am outside running, walking, hiking or biking. The Garmin VivoActive connects to a Heart Rate Monitor for when I do my dedicated workouts so I can track my heart rate and get the most accurate calorie counting during those workouts. The Garmin VivoActive is a full-featured SmartWatch that indicates when I receive a phone call, get any message notification and also shows my calendar and weather information and even allows me to control my iPhone Music remotely. The Garmin VivoActive has a nice form factor, not too large or heavy and can be worn in pretty much any situation from intense sports activities to formal attire. So far the Garmin VivoActive is my favorite Activity Tracker because it incorporates most everything I am looking for not only in a Fitness Tracker but also a Smart Watch. That’s the second thumbs up for the VivoActive so far! Mike answer gives you valid points for why he loves this tracker that I can completely agree on. If you are a personal trainer, fitness club owner or just an ordinary person interested in training, you should definitely check out Nate’s site fitnessequipmentcafe.com. Nate is a personal trainer and former fitness studio manager and has lots of experience with tools for getting fitter and healthier. He really knows what he’s talking about! Follow him on Twitter too. I have become more and more interested in the activity tracker market as the integration between trackers and the smart consoles on commercial cardio equipment in the gym environment become more commonplace. It’s a really interesting space to watch! I am currently wearing the Garmin Vivoactive. It is on loan from Garmin while I test and review it. It’s a really cool watch packed with some nifty ‘smart’ features! My favorite thing about the VivoActive is its performance in the pool. I hate counting laps, and it has been a great partner in that regard. For that reason alone, I’ll miss it when it’s gone. Plus one for the waterproof VivoActive! What is my all-time favorite activity tracker? Wow. Tough question! I’ve liked aspects on nearly every tracker I have ever worn. For me, my all-time favorite tracker is the Garmin Vivofit 2. I love the fact that I don’t have to recharge it (It has a 12 month+ battery life). I also like that I can swim with it and it syncs wirelessly with Garmin Connect via Bluetooth. The Vivofit 2 has a functional, constant display including the unique Move Bar with audible chime which reminds me to move regularly. Overall, it is a genuine 24×7 activity tracker, that I am never forced to take it off! I totally agree with Nate. The Move Bar is a brilliant function, and makes you move just a bit more every day. I will write about the Vivofit 2 later, especially looking at differences between the first one and the second version. Which fitness tracker are you wearing right now? What is your all-time favorite activity tracker? Be sure to tweet this article if you like it by pressing the big blue button above. Joshua’s site, HASFit, stands for Heart And Soul Fit and have tons of free, quality, stuff like workout videos and fitness programs for all levels and goals. The site also has a great section with nutrition advice. Be sure to subscribe to his YouTube channel with over 50 million views and follow HASfit on Twitter and FB. I exclusively use VimoFit for my Sony SmartWatch 3. It’s a free app that automatically identifies your strength training exercises, counts your repetitions, and logs your workout for you. For years, runner and cyclists have had many devices and apps to choose from to automatically track their workouts, but VimoFit is the best solution for the 70% who exercise at home or in the gym. I’ll be switching over to their Apple Watch app soon when it comes out in September. Honestly, other trackers don’t appeal to me because they only track steps, not exercises. Pedometers have been around since the 1600’s. Thank you for reaching out to me! Thanks for your reply Joshua. VimoFit is a beautiful product both in terms of design and features. The automatic tracking of workouts is something few ordinary activity trackers can do. The VimoFit can count bench presses, which is pretty cool. TheFitBlog is written by the two passionate fitness enthusiasts Christel and Tobias, who aims to give people tools and advice to reach their fitness goals. The blog has a section dedicated to how to get Fit With Diabetes, which is worth reading if you have diabetes. Follow their great work on Facebook, YouTube and Twitter too. I wear a FitBit HR every day. I use it for tracking my exercises and making sure I move enough throughout the day. The HR is accurate enough that I can use it to push myself during cardio sessions. However, it has a hard time picking up quick increases in heart rate ( HIIT is a challenge for it). I also use MyFitnessPal daily, both to track that I’m eating enough and that it’s the right stuff. I focus a lot on hitting my macros. My favorite tracker is MyFitnessPal since food is my main challenge. It also helps me track how many carbs I eat, which is super important for me since I’m diabetic. 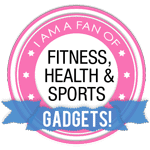 You can read more about how I use both trackers in our latest post on fitness gadgets. Thanks, Christel. FitBit Charge HR is one of my favorites too since it came out. I waited so long for it to hit the stores. Danielle runs the blog Fashion Fashionista that covers fitness, lifestyle, weight loss, and self-made printables which are really cool. She is a great graphic designer too. Follow the ‘motivating mommy’ on Twitter, Pinterest, and Facebook when you are done reading. I am a Fitbit Flex girl all the way. I have tried a few others and didn’t like them nearly as much as I love my Fitbit flex. Fitbit has proven to be one of the largest and most popular activity tracker brands in the world. The Flex was revolutionary when it came on the marked in 2013 and a number one best seller on for instance Amazon. We are reaching the end of this article. I’ll be happy to announce that I got a very some very interesting answers from the pro, the5krunner. I am not wearing any device. I have just taken off my Garmin Forerunner 920xt (also a tracker). I actually was looking at the steps on it but only because I had just installed Garmin software on a new PC and was messing around. I don’t use an activity tracker as I don’t think there is a single one on the market that is properly up to the job that I would use it for. My favorite one is the MS band which I do not own but was loaned one from Microsoft. It ticked nearly all the boxes. In the future, I have vague expectations of a great product from Jaybird Reign, but I have heard there are teething probs. In reality, I think that Polar will be the next company to come up with a proper product. Their M400 is nearly there, and my blog lists a recent announcement to put optical HR on a low-end wristband. Don’t even go down the route of the Apple watch. It looks great but lacks in VERY many areas. Look at my site or wareable.com. It’s just beautiful eye candy. Globally: What is missing is HRV analysis on the wrist. That is missing in the entire market by everyone. It might be brought to market by ‘some company’ later this year. Hush hush. Thanks for the long and informative reply. An implant in my wrist is a scary thought, but it might be the future as you say. the5krunner is a blog about running, triathlon and duathlon. It’s a nice site written by an athlete with clear goals and vision and lots of informative articles. the5krunner offers online personalized coaching for athletes that want to boost their shape for the next triathlon. Check out Facebook and Twitter too. Well, guys, that’s it for now. Please leave a comment below on what you thought about the article and share with others who will find it interesting to read. I would also appreciate tips on who to ask next time and about which subject. Also be sure to go up again and visit the sites of the experts above if you haven’t already, but after you have shared this article with your friends. Hi there, thanks for this post. I recently started paying attention to the activity tracker on my smartphone and it has become kind of an addiction. I have been contemplating moving to a more hightech activity tracker and will definitely use this article to help my make my decision. Thank you! Love this article! What an awesome line-up you have here. I will definitely follow you blog for more fitness information. Which gadget would you recommend for a cyclist? Thanks for your comment. I’m very satisfied with the post and it turned out just as interesting as I hoped. For cyclists there are many choices, but I will definielty recommend that you read my TomTom Multi-Sport review and perhaps also my review on Garmin VivoActive. very nice, I’ve always questioned the fitness trackers because I don’t see anyone use them. But by having a lot of people from this website give them their experience of fitness watches, really does help people in in gaining a new perspective of it. I think I might actually get one. Thanks. Fitness trackers are really popular these days and also a necessity for serious athletes and regular folks looking to get the most out of their workouts. But some of them could be a little expensive and most people are unaware of which ones are best to buy. You don’t want to be wasting your money with bad purchases. You have provided a thorough and informative resource from experts in the field. I myself have a fitbit. Whats your choice? Regardless of which one of these you choose, I think you point out an important need in the fitness industry. I personally prefer a different fitness tracker, but it is an app that I use on my phone. I also have a workout tracker that keeps of reps and sets for me. The important thing to recognize is that tracking your progress gives you motivation and helps you with your progress. Good job pointing this out! Hi, Jared! Thanks for the comment. I agree that motivation is key. And a fitness tracker should be a helpful tool in your training, not just a gadget you carry around just to be cool.